This course explores the key Jewish values that were so influential in molding our civilization. The lessons focus on areas outside the domain of the synagogue and Jewish ritual, and explore what it means to live as a Jew in “the rest of our life”. How is a Jewish woman expected to interact with the world around her? What does it mean to live Jewish? This 7-part series promises to shine a spotlight on the Torah view of our social and ethical responsibilities, and guide us in how to live larger than life by weaving G-d into every detail. It is part of the Jewish Learning Institute and the course will be taught by Sarah Alevsky. Purchase the entire course for $100 and you will receive a book and you don't have to register for the individual classes. (Just let us know if you are going to miss a class). Each one stands on it's own, but the course is a journey best undertaken from start. Register per class at $20 per. You can separately purchase a copy of the course book for $25 if you would like one. Location: Private location in the West Sixties. Address to be emailed. 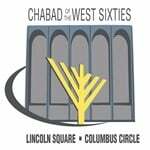 I would like to receive news and updates from Chabad of the West Sixties by email. Thank you for your registration! Any and all donations welcome to help support Chabad's activities benefiting the Jewish Community in the heart of NYC.